Every year in April, after the last customer leaves, the staff close down the business. But before they go home they make sure that the sprawling hotel that they have run during the winter season now flows quietly back to the nearby river in little streams. They will come back only in mid-November, six months after, to claim the hotel back from the water. 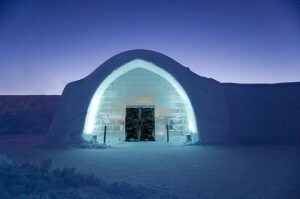 Come to Lapland in Sweden, 200 kms north of the Arctic circle to spend a night in the largest Ice hotel in the world. You will see painstakingly-cut large chunks of ice from the still river, Torne are carried inland where skilled ice artists lock them into proper slots. The Ice hotel in Lapland is the largest in the world. The roof is made of ice; the walls are ice, the floors are ice, the chandeliers are ice, the beds and chairs are ice, the artworks and furnishings are ice, the cups and plates are ice…. but take heart. The temperature inside never dips below -5 degree Celsius. It was in the 1980s a Swede named Yngve Bergqvist had a vision about building an ice hotel in Lapland in the Swedish village, Jukkasjärvi. Few were around to laugh at Bergqvist’s hilarious plot. In the dark, wintry region deep inside the Arctic circle, nothing would flourish, they were sure. Bergqvist was determined. He traveled to countries like Japan to see models in close quarters. 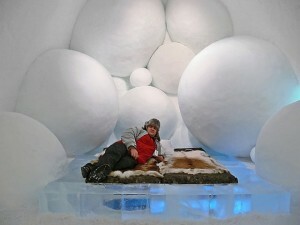 There were other ice hotels, but Lapland was going to have the largest in the world. Soon the Japanese ice architects were brought to Jukkasjärvi to study the feasibility of setting up an ice hotel in Sweden. 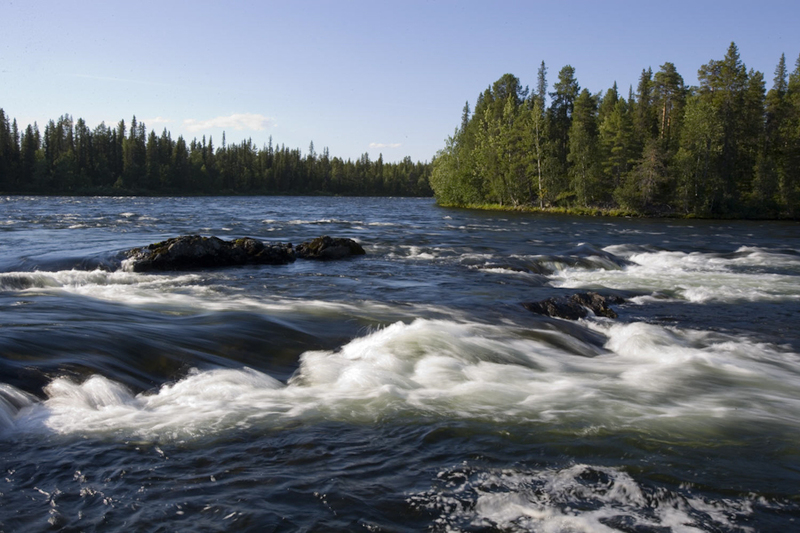 They found Lapland a sweet spot, where the river Torne flowing close to it promised to provide the most important building material – ice. So when November came, Bergqvist’s men began their work; they cut large ice slabs from the now-stationary stream with machines, and carried them to the spot where they were planning to set up the wonder. Bit by bit the ice artists chiseled away what was not hotel from the frozen river. The first ice hotel was not large, but certainly loud enough to attract attention. As years passed Bergqvist was proved right; the number of customers streaming to Lapland shot to stratosphere in a short period. From November onwards they begin to pour in to witness one of the weirdest architectural feet from the ring seat. Once the workers spray the steel frames with snow and freeze them further to make a rigid edifice, they turn their attention to build the inner walls. Experienced ice artists are selected from all over the world to put together a stunning interior which will not carry anything from the last year’s theme. When the hotel finally comes alive with artificial lights, the world outside, the whole Arctic region might have slipped into uncanny darkness. For many months from now, the sun never reaches above the horizon. The snow glistens and crunches under your feet; the atmosphere gets electric with the chance of northern lights brightening up the sky any moment. The official brochure advises you to spend one cold night in the Ice hotel, and several others in warmer cottages they provide to have that perfect Ice hotel experience. You won’t be able to take it more. Want to warm up a bit? Down a passage the Absolut Icebar serves colourful cocktails to ease your eyes already strained with the translucent icy blue you see around. 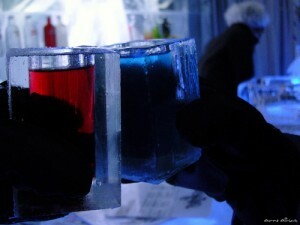 Drinks come in shot glasses made of ice; half a million of them are used in a single season. You must wear gloves to hold the plates and glasses, or they will, taking a bit of warmth from your hands, melt right through your fingers. As you drink, see how the heat from your lips molds the cup exactly to the contour your mouth. Time to hit the sack, sorry, ice. With a spread of reindeer hides thrown over the ice bed and super-warmed sleeping bags you will hardly notice the frigidity beneath, but the ice walls will stay around, shimmering in blue radiance, until you fall asleep inside this chunk of frozen river. What will you be like on your bed that night? Dressed in thermal underwear and many warm winter clothes over it, you will sleep wearing gloves and a cap. Even your boots stay intact on your feet, to keep the frost at bay. There are 47 rooms in the Ice hotel – one deluxe suite, 16 Art suites, 20 ice rooms, 8 snow rooms and 2 group rooms. But the design and proportions of rooms change every year. The largest ice hotel in the world is built each year from the scratch. What can you do in such frigid climate to keep your spirits up? You can refresh yourself in the sauna, or you can make a trip to nearby towns, or you can even get married with your wife again at the ice chapel, (Er…marriage on the rocks!!! That has a different meaning, man!) attached to the hotel. 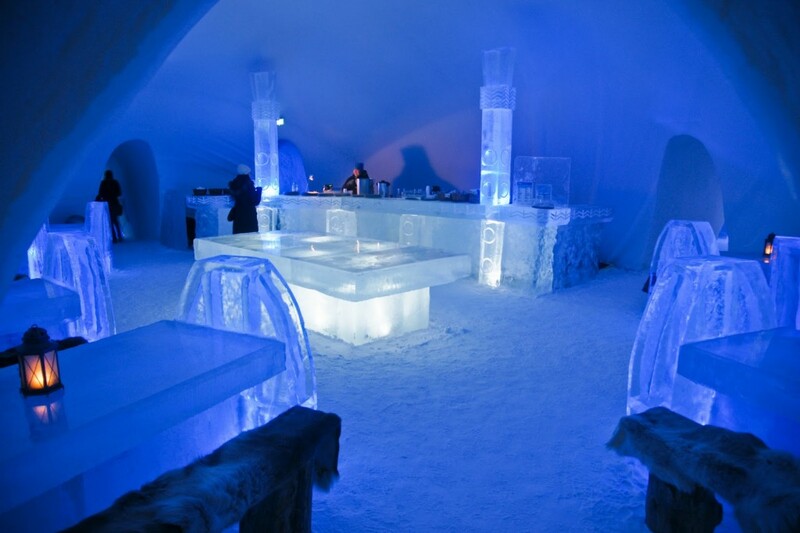 Like the river Torne, from which the artists hew out the wonder, Ice hotel never stands still. It rises and melts down with the seasons (As you read this there is no ice hotel existing in Sweden. The hotel is presently pure river). So here at Lapland, you can never stay in the same river twice. Ha.. u rocked my boat! Let’s hit the skid with a drink. Keep smiling!